An evergreen, aromatic shrub which flourishes in the spring and summer on hillsides and near watercourses. In the Bible it is mentioned definitely in the later books only ( , Isa. xli. 19, lv. 13; Zech. i. 8, 10, 11; Neh. viii. 15), although the Halakah explains the "boughs of thick trees" of Lev. xxiii. 40 as myrtle-boughs, and the "thick trees" of Neh. viii. 15 as wild myrtle (Suk. 12a; Yer. Suk. iii. 53d). The berries, which are not edible, are green at first, but when ripe become black, and are frequently closer together than the leaves (Suk. iii. 4; Babli 33a, b; Yer. Suk. 53c). In the ritual this shrub was used in Biblical times during the Feast of Tabernacles. Two requirements were necessary in the material for the booths: (1) the wood of the boughs must be covered with leaves; (2) the leaves must look as if they were braided. The passage relating to the "branches of thick trees" (Neh. l.c.) was taken as requiring the boughs to resemble a hurdle-work of three strands (Sifra, Emor, 102d; Pesiḳ. 184b). R. Ishmael required the leaves to form triple verticils, while R. Akiba was satisfied with one. R. Kahana demanded two opposite leaves alternating with a single leaf, the so-called wild myrtle of Babylon. Still another variety was known in Babylon, the "miẓra'ah," either the Egyptian, although the myrtle is not indigenous in Egypt, or, less probably, the hedge-myrtle, which has seven whorls. In Babylon endeavors were made to cultivate the myrtle; for the Mishnah allowed the use of fresh shrubs only. Practical conditions later rendered this rule impossible, so that only such myrtle was forbidden as had leaves so dry as to crumble, and had changed from green to white without even a fresh green leaf at the tip. Besides at the Feast of Tabernacles, the myrtle was used in the Habdalah; for when incense fell into disuse the myrtle was substituted for it (Ṭur Eben ha-'Ezer, 62, end; Ṭur Oraḥ Ḥayyim, 297), although if this could not be had, sweet calamus, cinnamon, or nutmeg might be used (Coronel, "Zeker Natan," p. 28b; Abudarham, p. 57c). The use of the myrtle is explained in several ways. At the end of the Sabbath the fire of hell, which has ceased during this day, again begins to burn; and its evil odor is dispelled by the perfume of this shrub (Tosef., Beẓah, 33b; "Or Zarua'," p. 48a; "Hekal ha-Ḳodesh," p. 46c). When the spiritof the Sabbath departs, it must be refreshed by the myrtle, in conformity with Isa. lv. 13 and lvi. 2 (comp. Zohar, ii. 204b, 208b; "Roḳeaḥ," p. 79b; Ṭur Oraḥ Ḥayyim, 297; Tosef., Pes. 102b; Tosef., Beẓah, 33b; "Manhig," p. 83b, No. 63). According to the Cabala, the oversoul vanishes; thus soul and spirit would be parted if the perfume of the myrtle did not unite them (Zohar, iii. 35a). This shrub is the one on which souls grow ("Tola'at Ya'aḳob," p. 27; "Shene Luḥot ha-Berit, "p. 139b), and its three verticils symbolize the three patriarchs (Zohar, l.c. ; "Tiḳḳunim," 3b). At circumcision in Babylon, according to Kohen Ẓedeḳ, gaon of Sura, a decoction of myrtle and other fragrant spices was used; while at the redemption of the first-born it was a geonic custom to pronounce benedictions over wine and myrtle ("Sha'are Ẓedeḳ," iii. 11 et seq., 22b; Ḳid. i. 41). At the marriage ceremony a dance with myrtle-branches was performed before the bridal pair, and the house was decked with myrtle and palm (Bacher, "Ag. Pal. Amor." iii. 36; Shab. 110a), while the groom wore a garland of roses or myrtle (Soṭah, 5b, 49b; Tosef. xv. 8). Over a coffin myrtle-boughs were spread (Rashi on Beẓah, p. 6a); and in paradise roses and myrtles bloom, so that the sanctified bear branches of the latter in their hands ("Perek Gan Eden," p. 26). 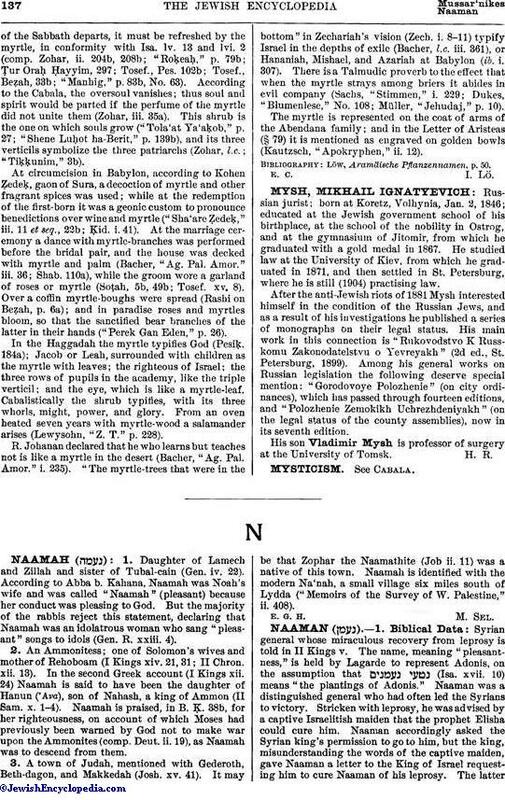 In the Haggadah the myrtle typifies God (Pesiḳ. 184a); Jacob or Leah, surrounded with children as the myrtle with leaves; the righteous of Israel; the three rows of pupils in the academy, like the triple verticil; and the eye, which is like a myrtle-leaf. Cabalistically the shrub typifies, with its three whorls, might, power, and glory. From an oven heated seven years with myrtle-wood a salamander arises (Lewysohn, "Z. T." p. 228). R. Johanan declared that he who learns but teaches not is like a myrtle in the desert (Bacher, "Ag. Pal. Amor." i. 235). "The myrtle-trees that were in the bottom" in Zechariah's vision (Zech. i. 8-11) typify Israel in the depths of exile (Bacher, l.c. iii. 361), or Hananiah, Mishael, and Azariah at Babylon (ib. i. 307). 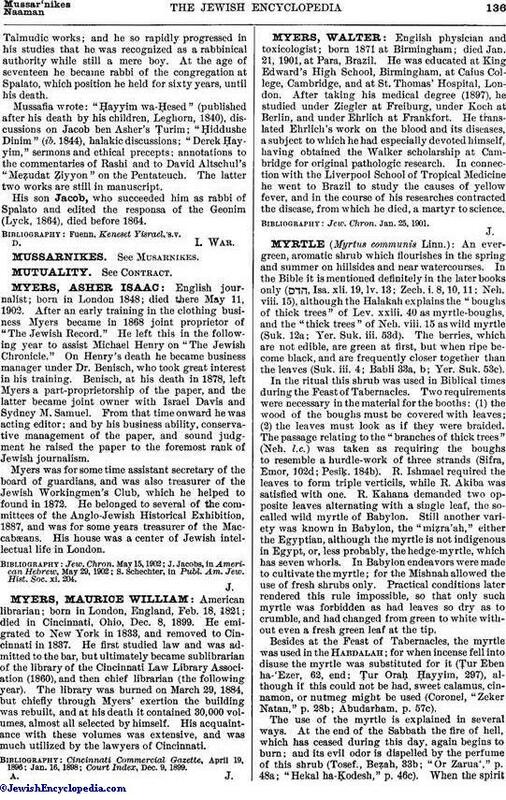 There is a Talmudic proverb to the effect that when the myrtle strays among briers it abides in evil company (Sachs, "Stimmen," i. 229; Dukes, "Blumenlese," No. 108; Müller, "Jehudaj," p. 10). The myrtle is represented on the coat of arms of the Abendana family; and in the Letter of Aristeas (§ 79) it is mentioned as engraved on golden bowls (Kautzsch, "Apokryphen," ii. 12). Löw, Aramäische Pflanzennamen, p. 50.